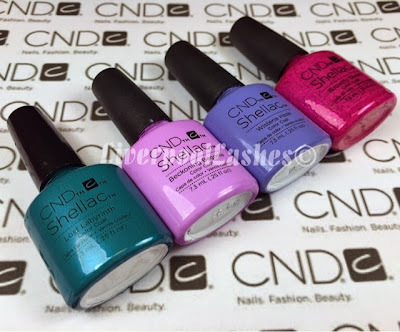 Today is another 'Focusing On' post, this time with the exciting new shades from the CND Garden Muse collection. If you've like to see my other 'Focusing On' posts - click here. 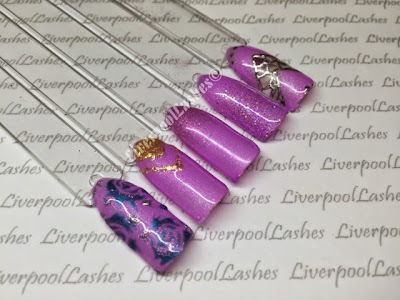 Beckoning Begona is such a beautiful shade with the prettiest shimmer so I was keen to play around with it and come up with a few design ideas for you. I'll go from left to right of the above photo. I used Lost Labyrinth and new glitter Lecente Stardust in 'Cluster' to and paint the roses. I then added pave diamond in leaf shapes around the roses. With a glitter paste of the new Lecente Stardust in 'Starlight' I painted the chevron design. I used the new Lecente Cluster glitter to add a simple fade. Another perfectly complementary fade with the new Lecente Baby Blue glitter. Finally I painted Beckoning Begona with a negative space. I then used Steel gaze to paint a design and added silver foil to it.